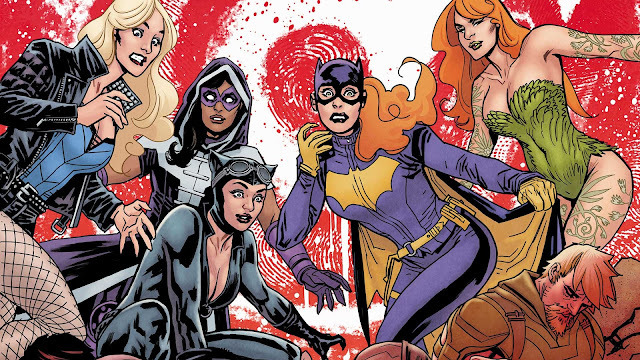 The Birds of Prey are back for another arc.......... and really, there's nothing to really say to get you into this issue besides for recently, the Birds have worked with Catwoman and Poison Ivy so for the most part, those two are on the up and up and their inclusion in this story makes sense for what we've been given previously. So yeah, that's about it. 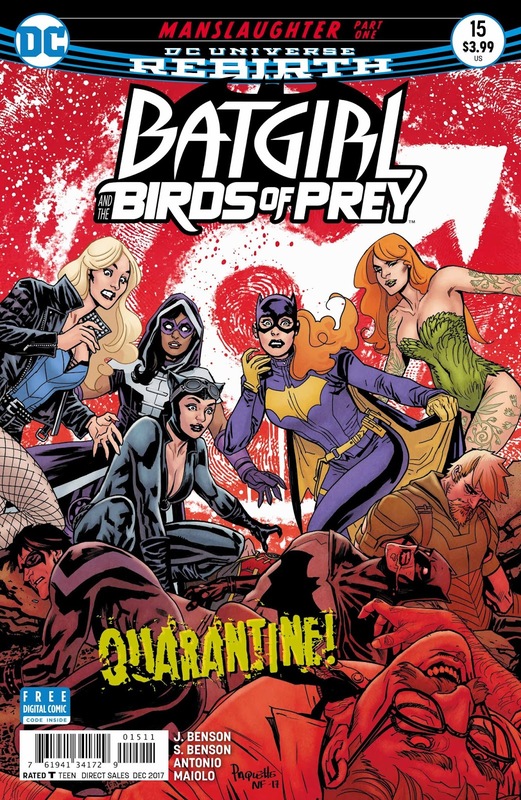 Let's jump into this issue and see what happens when a flu takes out all of the men in Gotham and the Birds of Prey are the only ones who can stop it. Let's check it out. Our issue begins with Commissioner Gordon in the hospital as we begin to see the scope of things to come because while Jim is sick, the Chief of Police, who was supposed to be covering for him is sick as well and so is the Mayor. 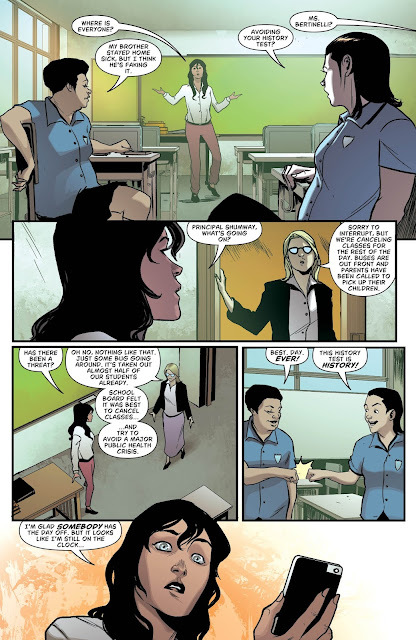 With all this sickness going around, Lois Lane, who was in Gotham for another story decides to try and get an interview with Gordon about what he thinks is going on and what it takes for a man who has never taken a sick day to finally throw in the towel on his attendance record. 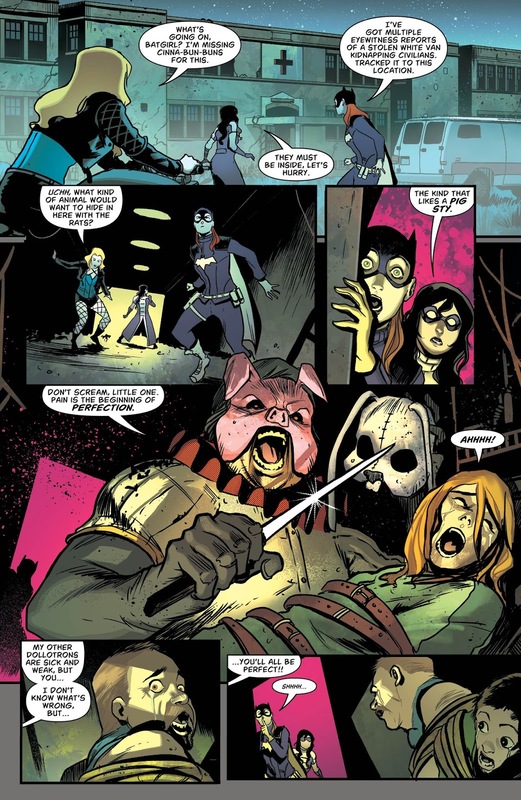 We see the sickness escalate as the schools are shut down and even the villains are becoming affected by it as we see when the Birds take out Professor Pyg, but it isn't until Batgirl starts looking at the admittance records to the hospital that she discovers that everyone who is sick is also a man. I guess it was a bad time for Green Arrow to come to Gotham to visit Black Canary, but it doesn't really matter because while some criminals are using this sickness to their benefit, Oliver is forced to stay in the Birds' Watchtower, while Canary goes after a pharmacy robbery and Huntress tackles a jewelry store theft. In the end, Canary goes up against Harley Quinn at the pharmacy, which doesn't make any sense for the character because she's supposed to be in the Suicide Squad and also because she wants to make sure the Joker is okay and Huntress goes after Catwoman. 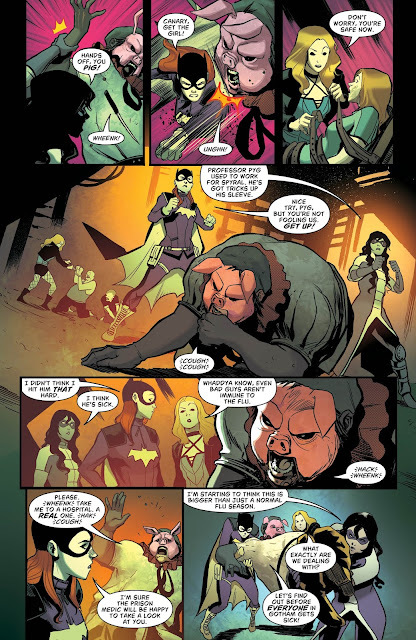 Once everything is explained though and after they rule out Poison Ivy as a cause for this flu, everyone joins up together to try and figure out who's behind this, including Batwoman, Orphan, Spoiler and Gotham Girl..... who doesn't make much sense being here, but that's not all. After a hands in, go team moment, Wonder Woman joins the team as well. 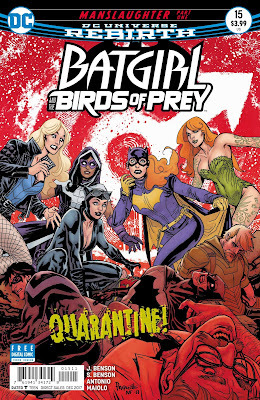 That's it for this issue of Batgirl and the Birds of Prey and while I loved that the scope of this book seems to be bigger than it ever has, complete with a cast of heroes to tackle such a problem, some characters like Harley Quinn don't make sense in this issue by the way that they're written and Gotham Girl just being there for where we left her character in the Batman series doesn't make sense either. The art in this issue was fantastic and while I love the basis for this story, the characters just showing up when they did felt forced. I hope that everything comes together in the following issue because this finally seems like a story worth reading in this book. You'll definitely get a huge cast of characters in this book and while that's cool and the reasons behind it are cool, it doesn't follow through completely with how some of the characters act, why they're doing what they're doing or why they're even there. I look forward to where this story goes, but as of right now, some of the elements just seem thrown out there just because.